Well I went thrifting today and because of my finds I didn't bother going to Gap to look for the cardis. Inspired by gorgeous blogger Silje, who loves velvet blazers, I wanted to get one for Autumn too. I was pleased to find this one today at St Francis Hospice for £4!! A quick photo before it was whisked off to the dry cleaners-sheesh, the dry cleaners bill is more than the cost of the jacket, haha!! 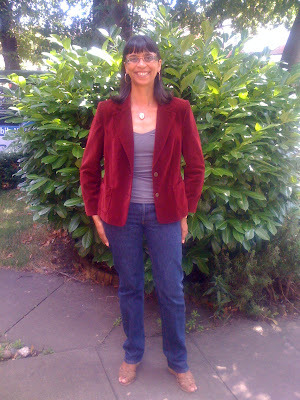 I'm wearing the burgundy velvet blazer with my grey Gap vest top and Miss Sixty Truman jeans, all from the charity shops. I also bagged two French Connection thick cotton camisoles, which will be ideal under this sort of jacket or cardigan, plus I got a Gap shirt, which is from this years collection and is Autumn colouring too! I've decided to thrift for cardis, as although I really like the Gap ones, at least it gives me something to look out for when I do go thrifting, rather than buying stuff I don't really need-no more dresses or bags for the moment! very cute! you're ready to jump into the fall! That is a great blazer. Hi Wendy-thanks so much and have a great weekend!! Hi ren-haha, yes I'm getting there! Hi wendy-thanks a lot-have a good weekend! I love the color of the jacket. The wole look is very fall, but still works for summer. Great job! hi fashiongirl22-thanks so much for your lovely comment and have a great weekend!! Velvet + Burgundy = fall wear crush! Wonderful find. That blazer is lovely, the colour and textures look amazing perfect for winter! Nice blazer! Haha, shame about the cleaning. i've always wanted a purple velvet blazer. one day i'll find one! Hi fashion chalet-thanks my dear-have a great weekend! Hi Acielle-thanks for your lovely comment! Hi fashion dreamer-thats lovely of you, thanks!! Hi b-thanks and haha,yes but at least its done now!! Hi thetinylittlegirl-I'd love to see this if you do get one!! that colour looks so fab on you! great find! that is just gorgeous. lucky you. thank you for checking out my blog. oh...i've started Lonnie Love..which you can find on my profile. um..its a different take in 1st person. Hope you are having sunny weather and lots of fun this weekend. Hi ellie-thanks a lot.....I'll check it out!! I love it when you go thrifting and find exactly what you're looking for. You seem to be an excellent thrifter! Hi Susan-thanks so much, I try my best not to get diverted by other stuff though!! The color of your blazer is perfect! Hi yiqin-thanks a lot and have a great weekend! Hi sal-always lovely, thanks a lot!! Hi my fashion frenzy-thanks so much and for stopping by too! !